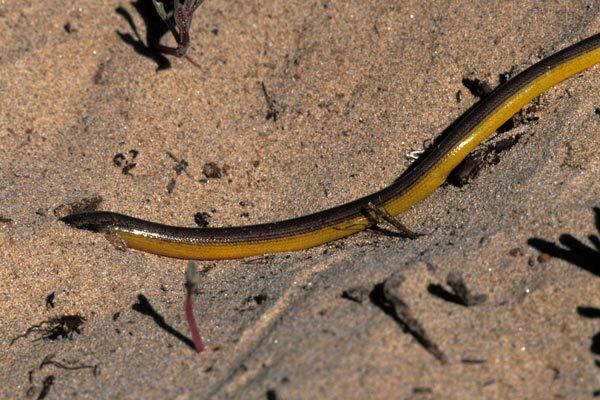 This species was known as California Legless Lizard until Papenfuss and Parham split out four new species in 2013. This is a beautiful shiny little lizard, no longer or thicker than the average pencil. 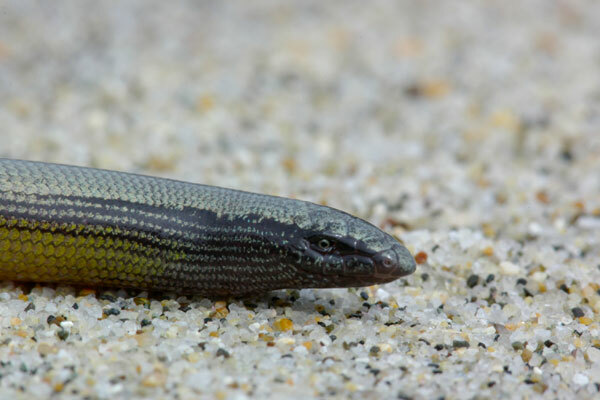 Although it has no legs, you can tell it's a lizard (well, OK, maybe not you, but the people who study these things) because it has eyelids, a tail that it's willing to break off as a decoy while escaping, and various lizardy internal organs and skeletal details. 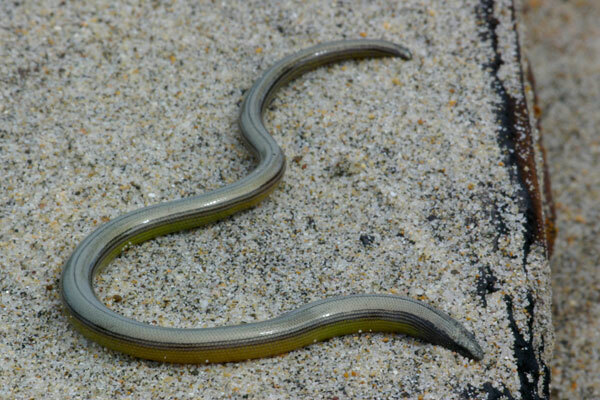 They usually live in loose sandy soil, and are eager to burrow away when exposed. I found this one under a piece of cardboard, and you can see in the second photo that it would rather be burrowing than posing. I was happy to finally see another one of these after twenty or so years. When I was a kid I saw a dozen or so at different times in southern California, but I hadn't stumbled across another since then. 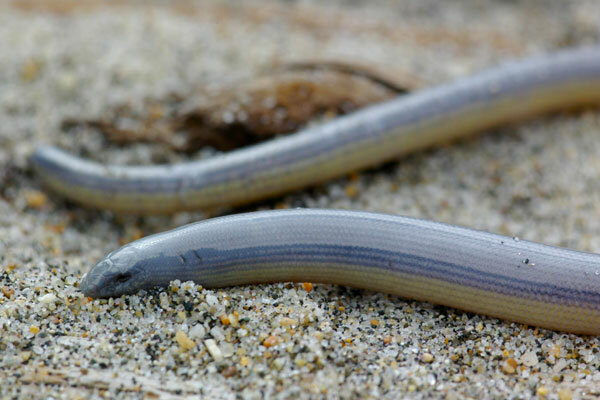 Many references split this species into two subspecies: A. p. pulchra (Silvery Legless Lizard) and A. p. nigra (Black Legless Lizard), but more recent studies have concluded that the silvery and black variations are just points along a continuum of shades, and not separable subspecies. Fellow herper Jackson Shedd invited me to join him on a visit he took to the Monterey area in search of Anniella pulchra and Phrynosoma blainvillii. Also in attendance were herper David Jahn from Livermore, and a small entourage of Jackson's family members. The day started out cloudy and cool, and we were initially worried that it would be too cold to find any lizards. However, within an hour and a half or so we had come across the two charming specimens pictured above. 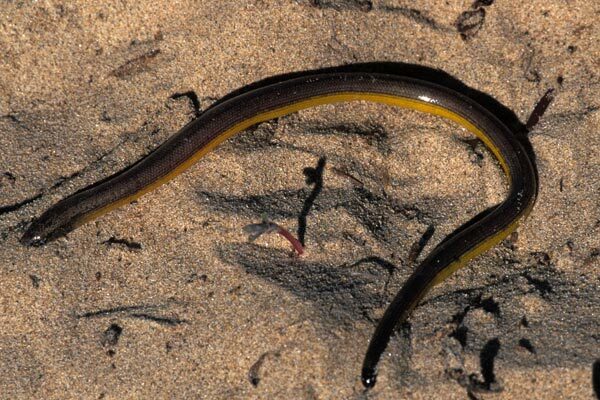 Note how differently the two are colored, and how neither is very dark dorsally, despite this being the absolute heart of the population formerly designated as the subspecies "Black Legless Lizard". We named these two after their discoverers: the larger, blue-gray one is "John"; the shinier, yellow-gold one is "Jackson" (we don't know what gender they were). Alas, we headed out to look for horned lizards before "David" could be found. In hindsight this might have been a mistake, since no horned lizards put in an appearance that day.